Fig. 1 A schematic view of our experimental setup (2). 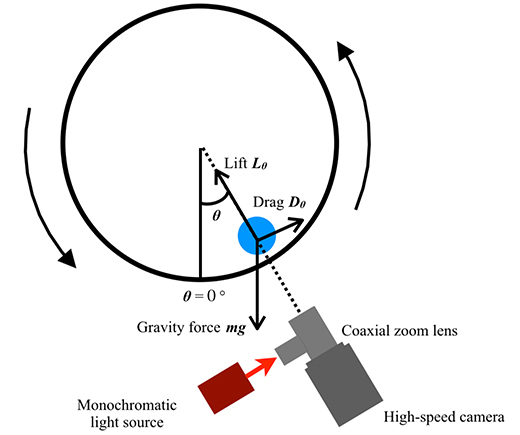 (1) Lhuissier, H., Tagawa, Y., Tran, T. and Sun, C., Levitation of a drop over a moving surface, Journal of Fluid Mechanics, Vol. 733, R4(2013). (2) 齋藤雅史，田川義之，移動壁面上を浮遊する液滴に働く揚力，日本機械学会論文集，Vol. 81, No. 825(2015), 15-00059.